I reported on Gilded Brute aka Johnny Falx in early January. His bedroom recordings found their way to my ears and I felt in love with his sonic oasis. It was a smattering of is songs, nothing more but his blend of almost arena rock prowess demanded a more focused approach. 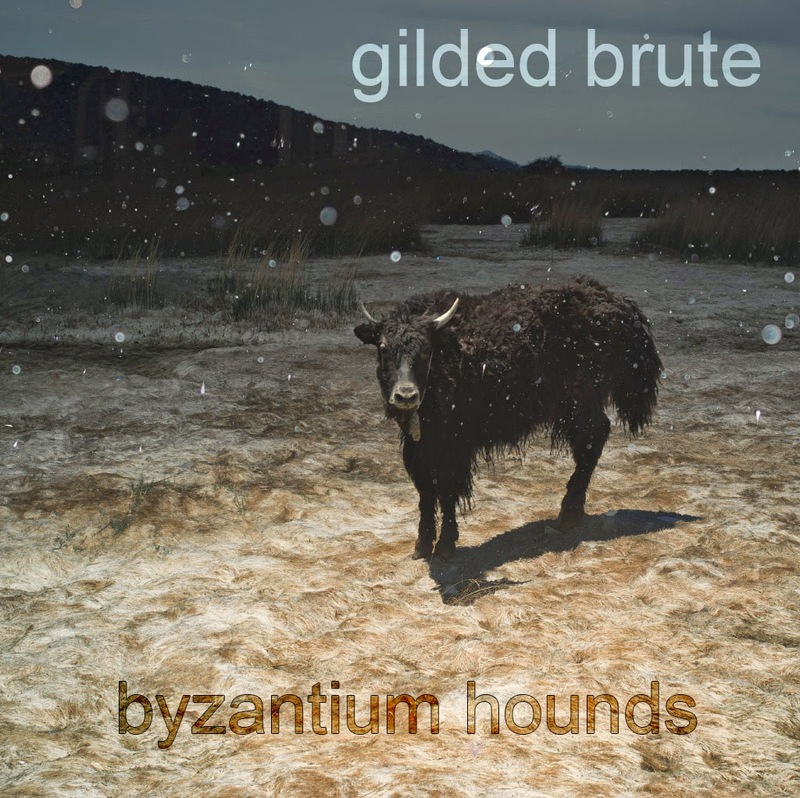 Thankfully he has culled 9 songs into an album entitled "Byzantium Hounds." Whether it is the fuzzy half step romance of If You'll Remember Me, the dissonant head banging of Thus Spoke The Coward or the progressive glammy rock of Sun Invincible he has single-handedly created songs that trade pretense for pure rock. Chainsaw Smile feels as much like gothic rock as it does dreamy noise post punk rock. I thought of Thurston Moore's current incarnation Chelsea Light Moving while losing myself in this track's the dense guitar sound. And when it comes to Gilded Brute, dense guitars is the name of the game. Don't underestimate the sheer power of rock, of walls of guitars so loud that the sonic assault strips away all your pain, mounting bills, jaded love affairs, brow beating bosses until all that remains is rock heaven and you are the God with the golden guitar pic. Somewhere in Greece, Falx holds sway over his own rock dominion and he is the total creator. It can feel totally retro. When he sings "Flames, flames in the sky" in Flames in The Sky (of course) if you have not given yourself up to Falx's world, if you have not swallowed the Kool-Aid the tone could be considered somewhat kitschy in that Sam Flax vein and I don't mean that in any dismissive way. Flax's take on modern music like his 80's drenched Fire Doesn't Burn Itself is addictive. So much so it graces the Grand Theft Auto Soundtrack. Gilded Brute / Johnny Falx's music in a similar way feels purest retro. Both artists don't play it campy, they keep it real and at least in Falx's case the songs hold emotional weight. Apart from the throw back aspect, the tone feels as much like retro rock as it feels current as this sound is being reinvented by the indie world everyday. The thick guitar rock and busy bass lines coupled with a thrashing walls of intense sound makes me think of Be Bop Deluxe, Dinosaur Jr, My Bloody Valentine and Diarrhea Planet blended into one. Rock on Johnny Falx aka Gilded Brute. The future looks bright.